Blog / General / The Perfect Worshipper? There is a story in the Bible that moves me every time I read it. It moves me so much, I wrote a worship song about it called “Alabaster Jar,” and I believe it also gives us one of the most complete images of worship in the Bible. With total disregard for the opinions of the men around her, this woman approached Jesus. We don’t really know why except that He must have done something wonderful for her, because her heart was overwhelmed with gratefulness (Some scholars believe this woman was Mary Magdalene whom Jesus cast seven demons out of. See Mark 16:9 and Luke 8:2.). And out of her gratefulness erupted one of the sweetest and most heartfelt expressions of love in all of the Bible. This woman—seeing the filthy feet of Jesus—bowed down at His feet and began to weep. Perhaps her heart broke that He warranted so little honor in the Pharisees’ eyes – they wouldn’t even have a servant wash His feet (as was customary). And so, she wept over the dishonored feet of her beloved Lord. She wept upon the dirt and detritus of the street, streaking his feet with her tears. Then she did something astounding. She unloosed her hair and used it as a dust rag to wash the feet of Christ. According to 1 Corinthians 11:15, a woman’s hair is her glory, and this woman used her glory as a rag to serve Jesus. But this woman didn’t just stop at washing Jesus’ feet. She went further. As she wiped Jesus’ feet, she also kissed them repeatedly, cherishing the feet of her Savior where others had dishonored Him. 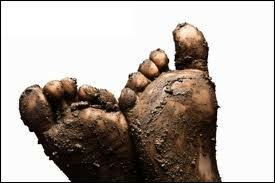 Then she took an expensive oil, unstopped the bottle and poured it on those dirty, mud-streaked feet. What an extravagance! What humility! What a demonstration of love! What a demonstration of value! What incredible “worth-ship” she gave Jesus that day! Is it any wonder Jesus felt loved? If only we could worship so well, bowing to the Lord, heart ablaze with gratitude, pouring our emotions out upon Him, expressing our love to Him, using our glory to serve Him and extravagantly giving value to Him. How could God resist such a people? How could He resist such a Bride? But in many churches, we’ve become like the Pharisees, sitting on our pedestals and judging the “inappropriate behavior” of forgiven, grateful worshippers. And then we wonder why our “worship” doesn’t win the lost. This is the only place I know of in the Bible where Jesus says someone demonstrated love to Him. How terribly sad! Only once in the entire Bible did Jesus say He felt loved, and the person who did it was criticized and mocked for it. But what if we all loved Him so well? I’m praying God will become so irresistible to us that such acts of worship become the norm. And I pray we would become so irresistible to Him that He makes Himself at home in our homes and hearts and in “tabernacles” everywhere. Thank you for being a vessel to bless the nations. Your insight is very powerful. Thank you for this post. I just saw you on the Joni Lamb program on DayStar. I’m very blessed with what you shared because I too am a true worshipper of our LORD and Savior CHRIST JESUS. my spirit rejoiced when I heard you spoke about worship and throwing kisses to PAPA DIOS (FATHER GOD) because I’ve been doing this for years. I love The LORD JESUS CHRIST & I can tell that yo really do also. I had to look you up. May our LORD continue to bless you, the ministry He has given you & your beautiful family. Hi Zach! Praise God! I thank Him for the Holy Spirit! This is a life changing read! It came even to pass, as the trumpeters and singers were as one, to make one sound to be heard in praising and thanking the Lord; and when they lifted up their voice with the trumpets and cymbals and instruments of musick, and praised the Lord, saying, For he is good; for his mercy endureth for ever:that then the house was filled with a cloud, even the house of the Lord; 14 So that the priests could not stand to minister by reason of the cloud:for the glory of the Lord had filled the house of God. There is nothing like being in His presnce. I need more of Him and less of me!!! Me too, Katherine. Thank you for your thoughts. Thank you, Nina. I’ll receive that blessing. May God bless you and your family too! Thank you, Nada. You know how it is, we come close to God and He gives us insight into who He is. There’s no place I’d rather be.